Put this card in play. 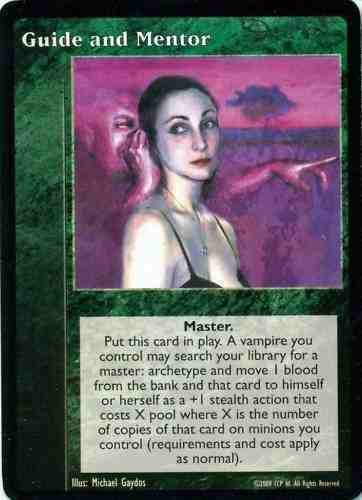 A vampire you control may search your library for a master: archetype and move 1 blood from the bank and that card to himself or herself as a +1 stealth action that costs X pool where X is the number of copies of that card on minions you control (requirements and cost apply as normal). Jyhad(TM) and Vampire(TM): the Eternal Struggle are trademarks and copyrights of Wizards of the Coast and White Wolf Game Studios. Neither Wizards of the Coast nor White Wolf Game Studios endorse this site or approve of anything on it. The use of these names is in no way a challenge to the rights of Wizards of the Coast or White Wolf Game Studios.